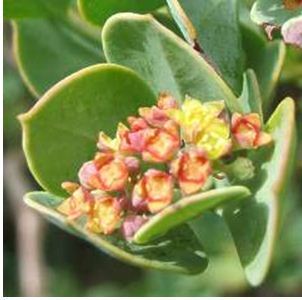 Cape sumach is a very decorative and useful plant, edible fruitbearing plant of Africa in cultivation as well as in its natural habitat. It is a hemiparasitic plant, in other words a plant that is capable of producing its own food (photosythesis) as well as utilizing nourishment from a suitable host plant by means of parasitism. This together with some other interesting features makes the Cape sumach a highly successful species. This plant occurs on coastal dunes and inland slopes from the Cape in the south to Kosi Bay on the east coast in South Africa. Plants thrive in sandy conditions. Cape sumach, together with other plants, forms an important soil stabilizer in coastal dune systems. Cape sumach is classified as a shrub although it can attain the size of a small bushy tree of 1–5 m in height. It is a partial parasite on the roots of plants. The Cape sumach has a smooth greyish bark and the leaves are opposite, stiff, erect and crowded up the stem. 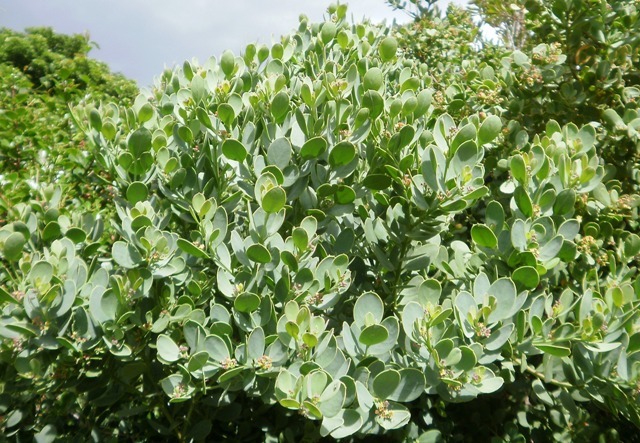 The elliptical leaves which are tough and leathery are 10–50 x 10–27 mm, and blue-green with a grey bloom. Flowers are small, about 2 mm across, yellowish green, slightly scented, inconspicuous and are borne in small terminal heads or panicles. Flowers are either just male on one plant or hermaphroditic (can be male or female on the same plant). The flowers and fruits are produced erratically throughout the year, but mainly from April to December. 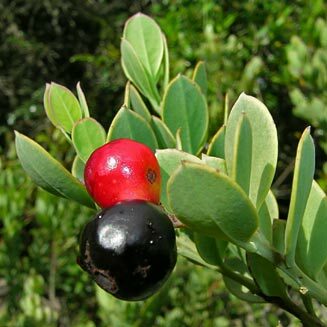 The fruits are highly decorative on the plant and are ellipsoid (elliptic in long section and circular in cross section), fleshy, about 15 x 10 mm, becoming bright, shiny red and then purplish black. Fruits don’t ripen all at once which is why these plants can be very attractive for long periods throughout the year. 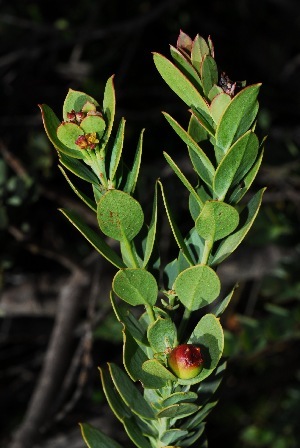 The fruits are edible and were an important food of the early inhabitants of the Cape. The fruit is also stored by local people for lean times. For doing that, the stones were removed from the fruits. The fleshy part is then compressed and stored. The fresh leaves are used to tan leather. A decoction of fresh leaves was used to dye cotton fishing lines and nets to make them more durable in the days before nylon. The wood is heavy and fine-grained, but because of the small size of the tree, it is suitable only for ornaments. Plants grow from seeds which fall to the ground. Seeds can be sown in situ (directly in the open garden), if there are other plants to serve as the hosts. It is not possible to grow plants from cuttings. Cape sumach is not well established in cultivation and best left to reproduce naturally. Plants do exceptionally well in coastal areas and are very tolerant of windy conditions. It is recommended as a seaside subject and plants form very effective small windbreaks provided there are enough host plants.